Look in any home and garden publication a month or two before Thanksgiving, and you’ll see all sorts of elaborate table arrangements. Professional decorators go all out to create a veritable masterpiece. And if you check the prices on the items they use, you’ll often find that they spend several hundred (and often several thousand) dollars to get the table to look so nice. How can the average person compete with that? Usually, we can’t. 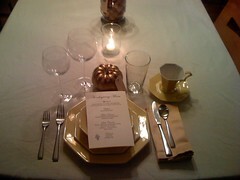 But we can make our Thanksgiving tables look great without paying an arm and a leg. Inexpensive items from the local discount store and things found in nature can be combined to create an elegant yet inexpensive Thanksgiving table. Here are some pointers. Tablecloths and napkins can be prohibitively expensive. But if you’re only using them on special occasions, you can get away with cheaper options. Dollar stores often carry lovely tablecloths at a fraction of the price you would pay at a high-end department store. They might not last as long as more expensive ones, but if cared for properly they will stay in good shape for several years. You can find inexpensive cloth napkins at some dollar stores as well. Or you could check outlet stores for discontinued or slightly blemished napkins. You can often find deals on tablecloths there, too. If you’re good at sewing, you could even make your own co-ordinating tablecloth and napkins. A pretty centerpiece adds a nice touch to any table. For Thanksgiving, you can make one at very little cost with things found in nature. Mini pumpkins, squash and other fall veggies can be arranged with some nuts to make a yummy centerpiece. If you want, you could find an inexpensive cornucopia at your local craft store and put these items in it. Fall flowers also make wonderful centerpieces. If you grow your own, simply pick some in various colors and arrange them in a vase. You’ll have a beautiful, fragrant centerpiece at no cost whatsoever. Of course, there probably won’t be a whole lot of room on the table for a centerpiece by the time you put all of the food on it. If space is a concern, taper candles are a simple yet elegant alternative. You can find candleholders at discount stores at very reasonable prices. You could place some leaves or gourds around them if you want to do something a bit more elaborate without taking up too much room. A beautiful Thanksgiving table isn’t necessary for enjoying all of that delicious food. But it certainly adds a nice touch to the holiday and lets your guests know that you value their company. With a little imagination, you can decorate the table and still have plenty of money to spend on dinner. Aloha Alyssa,My son John called me last eneivng here in Olympia WA to give me your web address.When I started scrolling down and saw Grandma’s babies I couldn’t believe it! Oh you did a Beautiful job capturing the beauty of my family!My son and his lovely and beautiful wife Kalei are wonderful parents and you can truly see the Blessings of their love, in their 3 handsome sons.Bless you and Mahalo,Margaret Allen.